I love to make everyone Christmas crafts...decorating wine bottles is my favorite! It's so difficult not to answer you question by saying "by singing loud for all to hear!" But..I'll be serious and actually answer the question. I'll say by listening to Christmas music. My favorite!! When I read the question I immedietly thought of ELf and him saying the best way to spread christmas cheer is singing loud for all to hear! I think my fav way is just to be in the spirit, smile, laugh, give and be joyus! Haha, I wanted to say signing loud for all to hear! Gotta love Elf. Baking with my friends and loved ones while jamming out to Christmas tunes is the best. We always gift our sweets and that seems to bring a smile to many faces. singing loud for all to hear!! I immediately thought of Elf too! listening to christmas music and baking does it for me! There are so many things! I think my favorite thing is getting together with friends to swap cookies, catch up on life, and listen to Christmas music! Singing loud for all to hear!!! I LOVE making treats and having people over! We are having a "Friend's Christmas" Wednesday! So happy to have found your blog! I'm a huge baking fan. I LOVE to bake for my friends all my favorite cookies and Christmas snacks!! I know it sounds cheesy...but I love sticking a dollar or two, my pocket change, etc. in the little red Salvation Army buckets. The bell ringers outside of my usual shopping destinations are a sure sign of Christmas. Retailers that ban them make me so sad! Thanks for hosting Meg! I loving making lots of edible and crafty gifts for my friends and family to spread holiday cheer! I love spreading Christmas cheer by singing Christmas carols! Christmas cookies and christmas cards of course! My favorite way to spread holiday cheer to is to send emails to my online friends letting them know what I appreciate them and enjoy what they do. It is always so busy at the holidays and people slow down and feel overwhelmed with blogging. I like to encourage them to take a break and come back refreshed and remind them they are making a difference even though it might not feel like it some times. I really love to bake up treats to hand out! I love making cookies for my annual Cookie Exchange and I like to sing to my Christmas Playlist with my 5 yr old son. I love to bake cookies and gingerbread for my neighbors and coworkers, and send silly christmas cards to family and friends! 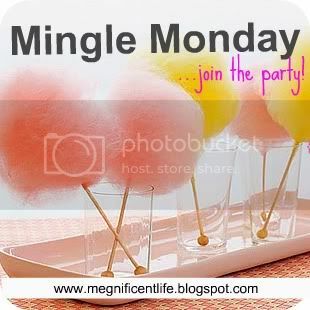 I'm loving Mingle Monday (even thought it's Tuesday already...I'm a little late). I just discovered your blog! My favorite way to spread holiday cheer is through giving gifts! I love making people happy and making custom gifts for them. I am excited for the ornament exchange! I don't know if I have a specific favorite, but this weekend I'm taking the youth at church to pack boxes of food for hungry children around the world. The best Christmas gift ever!